About 4 years ago late December of 2010, myself and two other girlfriends decided to get together for happy hour after work. We started talking about the women we ran into on trails asking where all the other ladies were and we also would hear complaints that there are no women to ride with. Well, between us, we actually knew a good amount of women mountain bikers. So we thought, let's get the girlz together so everyone can meet each other! So we broke out our calenders and chose a date....February it would be. So the next item was getting our local community of women riders together to discuss the "Get Together". About 15 of us got together at BJ's in Woodland Hills for dinner, drinks and brainstorming. Funny, we realized we didn't even have a name and that this just may turn into a GROUP or CLUB after the "Get Together" if enough women showed up, so we best be a wee bit prepared with at least a name for our new adventure. For the next several hours, we came up with the most funniest, out there, crazy names. We all finally decided that the acronym idea worked best. I don't think I could put it all into words. So much! I remember when I first joined and you Wendy invited me on a beginner ride in Reseda and brought me a demo bike! I had no idea about anything I had just started riding because of a running injury. I learned so much on that first ride and met women that I still love to ride with! Everyone was so helpful and encouraging. I think that really ignited my passion for MTBing. I met Yvonne Melanson through GGR and we pushed each other and encouraged each other and had many adventures, we still do! Riding with GGR and meeting so many inspiring women helped in my professional life as well. I think I am a better leader for it in my job. You learn how to build people up and encourage them. Find reasons why you can do something rather than why you can't! If they can do it I can and if I can do it I can help you do it too! The 1st get together would be at MCSP (Malibu Creek State Park). Which makes a great place for all levels of riding, nothing scary for beginners and all of us knew the trails really well to lead the rides. So we started just putting the word out, talked with local shops and put notices up on forums. Well, I can't recall the exact number, but it was close to 100 women that showed up just to ride and meet the others. WOW! I think we were on to something here! Maybe there is a need for this?? Many of the ladies were beginners who just wanted to ride with others women and learn and have a social outlet that included being outside. Sooooo...let's try this again in October! But this time let's give them some fun things to walk away with like goody bags, and maybe even some raffle items. Oh! How about a skills clinic for the beginners?? In my experience, being taught mtn. bike skills by a woman is much more effective than being taught by a man. Our verbal skill, personal knowledge of women's bodies and abilities and personalizing the experience makes for a much more relaxed and comfortable learning experience. The encouragement during the women specific skills clinics sponsored by GGR make a huge difference in a student's experience and outcome. So planning a simple event over 7 months is not always as easy as it sounds! But we pulled it off for the 2nd Rocktober event of 2011 with about another 100 women! We had a skills clinic given by Christine Hirst with over 50 beginner riders in it! Goody bags, demo bikes from LIV and a raffle. We also made this a CORBA membership drive with a special raffle prize for those who renewed or purchased a new membership. I thought this was really important to do being so involved in the community, helping with the old CORBA Fat Tire Fests and supporting what CORBA does I wanted GGR to partner up with CORBA. So now every GGR Rocktober is also a CORBA membership drive. CORBA is also on all of the GGR garb! Jerseys, shorts, jackets and vests! After 2 of these Rocktober events, it was just too much to plan 2 big events, work full time and continue growing GGR, so now the year would turn into rides, workshops and 1 annual big event every October. Rocktober #3 pulled in just under 130 women riders. We again had a successful skills clinic with 65 beginner women! TONS of raffles, guest speakers, the new GGR booth, goody bags and few vendors, demo bikes and more! GGR did a fund raising campaign within the club and was able to raise the $1400 to pay for a custom beautiful purple booth for our events! Which brings us to Rocktober #4, the biggest to date! 190 riders! If I released the entire waiting list, we would have had close to 300 riders! With more participants and growth of course brings new challenges. Lots and lots of riders on the trails! This was the 1st event we had over 12 vendors having booths as well as Liv Cycling and Trek bikes having their demo bikes at the event. We also added another skills coach this year. Leigh Donovan! Coach Christine Hirst of course coached as well as she always does for all the GGR events. CLIF provided the entire incredible fuel station for GGR this year! Everything from Recovery, hydration to blocks, gels and bars! Shredly! Shredly has supported every Rocktober event and makes the drive all the way from Colorado! Zoic! Zoic picked a woman out of the crowd and gave her a ZOIC make over! All Pro Bikes in Simi Valley came in as their 1st time at Rocktober with an awesome booth of everything fabulous including the incredible baked goodies they provided us! We welcomed SRAM as their 1st time with GGR! CORBA's presence as always was huge and right next to GGR. Mark Langton spoke about trail etiquette prior to the riders hitting the trails. The ever popular swap meet! This is always the busiest booth every year! Ladies bring their stuff to sell and swap! Guest speakers this year were Vet racer Nancy Harris, Jill Hamilton of Pedal Power discussing the women's race scene, Lisa Baker from the Unlikely Cyclist telling her story as well as tips on the importance of proper riding cloth fit. Our full list of sponsors for Rocktober is here: sponsors! With just under 800 GGR club members in the Los Angeles, Ventura, Inland Empire, San Fernando Valley, San Gabriel Valley and San Diego, we are growing leaps and bounds! In November, GGR opened up our very 1st chapter! The GGR IE (Inland Empire) chapter headed up by GGR Director Jackie Reseigne. Look for great things coming from this chapter! The new IE chapter has the same mission. To keep women mountain biking, have a blast and grow our sport by supporting each other on the trails. So what now for GGR?? Well...to complete the year, we have many rides and of course our fun holiday ride and party December 20th! This year we have Julianna's demo truck their loaded with bikes for us to demo on our ride! For 2015, GGR will be having a ladies lounge at some of the races manned by all GGR volunteers. A place for the ladies to come hang out, change, relax, get on the trainer and spin and just support each other with their presence. This will be at some of the Southridge USA races as well as Rim Nordic Enduro races. GGR will also be hosting some Wenches with Wrenches workshops, a women's weekend in Big Bear, more skills clinics, and our annual Rocktober event! I'm proud to say that GGR is a non dues club and welcomes all levels from rank beginner to pro. We are now the largest all female mountain bike club in the US and ALWAYS interested in helping women start their OWN GGR chapters! When I started riding (9 months ago) I thought I was too old and too fragile. I was resistant to put anyone out of their way to ride with me or ask for advice and/or suggestions. What I found in GGR was that I was not too old and not too fragile. More important, I found a group of women (and volunteer men) that were welcoming, understanding and generous of their time and sharing of experiences and knowledge. I am continuously and thankfully encouraged by the GGR Girlz and Boyz. In the last 4 years, I have seen the growth in the women's social mountain bike riding scene just explode. Social riders can be riders who ride 2-4 times a week to a few times a month. Why do we have this growth? I think the constant encouragement and welcoming of women of all shapes, sizes, levels and ages and making the scene super social and fun really attracts women! Offering an alternative to co-ed riding helps, and GGR also hosts co ed rides so women can bring their significant others as well. Rides, workshops, lunches, road trips, it's a social scene that keeps us healthy and allows us to enjoy the great outdoors and ride with our friends. Pretty easy sell if you ask me! Also, the industry is finally starting to catch on! From the actual bike companies like Liv, Trek and Julianna to the bike shops actually stocking women's cycling clothes and getting in more demo bikes. Now the shops have a long way to go, but I DO see a difference. We are also asking shops to host our Wenches with Wrenches clinics to get involved in their women's cycling community and work with us mechanically on our bikes as well. I didn't have the courage to try the sport on my own. My perception was that it was a male dominated sport and none of the men I knew wanted to take my hand and guide me through those vital beginner skills. I didn't have any girlfriends that rode dirt (though that has now changed) and I would never have gotten on that bike if it hadn't been for you, Wendy, and the support and camaraderie of the women in GGR. In 2014, GGR started hosting skills clinics with Leigh Donovan, Christine Hirst, and Ride Like A Ninja skills clinics. The enthusiasm and transformation in our riders was off the charts! In 2015 we will be welcoming Kat Sweet as part of the team as well with G2 Bikes hosting in the OC area in March. 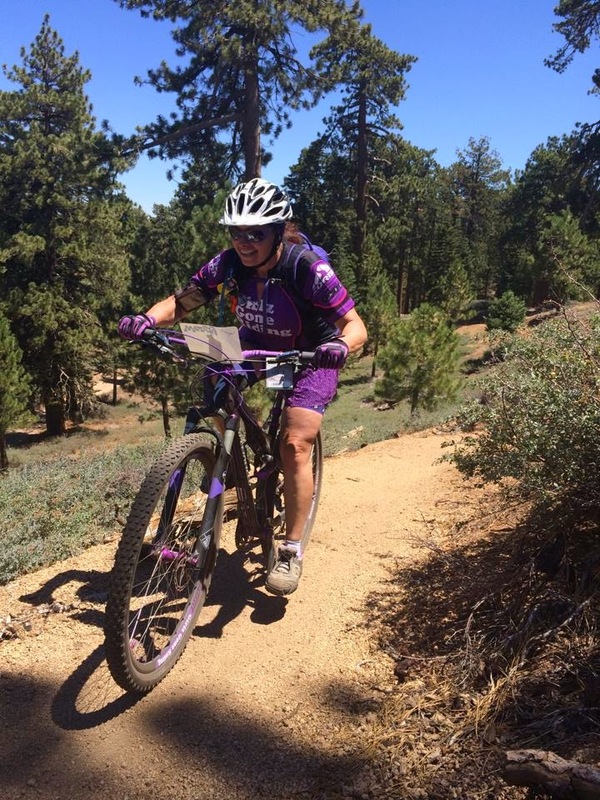 Women have just loved taking these clinics so far so they have better skills to ride more safely and can really have a blast on the trails. These are women only clinics as well, women love to learn with each other and the atmosphere is focused yet still a blast. 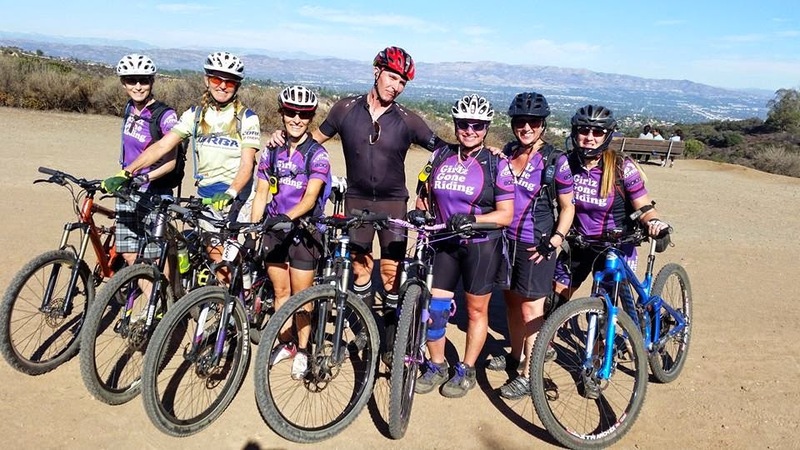 I see GGR's future focused on developing ride leaders and expanding chapters across the nation welcoming women into the sport we love so very much. Look for us in the purple jerseys. We are a super friendly group, so make sure you say HI! Investing in a Bicycle- Stories Needed!